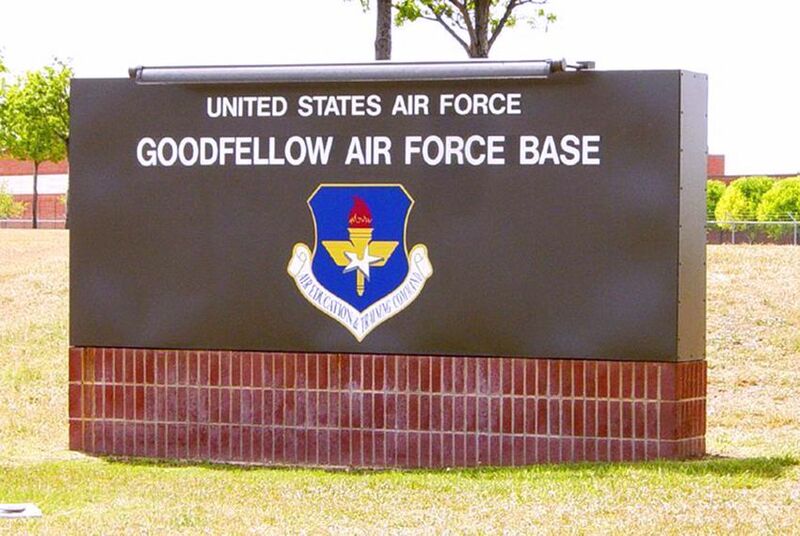 Goodfellow Air Force Base is one of two Texas military bases chosen to house undocumented immigrants. Residents are already volunteering to help, but details are hard to come by so far. The Goodfellow Air Force Base in San Angelo, Texas. SAN ANGELO — From its founding in the mid-19th century to support Fort Concho to its modern ties to Goodfellow Air Force Base, the residents of this West Texas town have always been strong supporters of their military neighbors. So when the military calls on the town to do something, “It’ll happen,” said Howard Taylor, director of the San Angelo Museum of Fine Arts. This week, Goodfellow, along with Fort Bliss near El Paso, was selected to house undocumented immigrant children amid a national uproar over the separation of migrant families at the U.S.-Mexico border. U.S. Defense Secretary James Mattis announced the decision on his way to Asia on Monday; the first minors are expected to arrive at Goodfellow by July 31. Taylor, like many San Angelo residents interviewed Wednesday, is preparing for the immigrants’ arrival and said he would be willing to run art programs for the children at the base. But like most other residents who spoke to the Tribune, he said he’s having difficulty planning anything because they’ve received so little information about how the shelter at the base will be run. Carol Ann Bonds, a retired San Angelo superintendent and one of Gov. Greg Abbott’s appointees to the 13-member Texas Military Preparedness Commission, serves as a liaison between the base and the city. She said she was told about the planned immigrant facility last week and expected to get more details from the U.S. Department of Health and Human Services over the weekend, but the details never came. She’s still waiting to hear how many children will come, but she said she’s expecting up to 7,500 unaccompanied minors — not children separated from their families when they crossed the border. The base’s public affairs office declined to comment. It’s not clear how long the children will stay at the base, but Bonds said they will be housed in wood-framed, tent-like shelters with air conditioning — similar to the tent city at the Tornillo port of entry near El Paso that currently houses undocumented minors. Bonds isn't the only one hoping for more information. U.S. Rep. Joaquin Castro, D-San Antonio, and other leaders of the Congressional Hispanic Caucus wrote to Mattis on Wednesday asking for details on the housing facilities at Goodfellow and Fort Bliss, including how many children would be housed there, how long they would stay and what conditions would be like. The need for space to house undocumented immigrants, especially children, has become urgent for the federal government since the Trump administration began a "zero tolerance" policy for illegal border crossings that led to thousands of children being separated from their parents. The national outcry that followed caused the president to sign an executive order to halt the family separations, and Customs and Border Protection recently announced it would no longer refer undocumented immigrants with children for prosecution. But the administration insists that zero tolerance is still in effect and it’s looking to the military to provide more space to hold families and children. The Pentagon was asked to prepare to house as many as 20,000 migrant children from July through the end of December. This isn’t the first time U.S. military bases have been used as migrant shelters: In 2014, amid a surge of unaccompanied minors entering the country from Central America, the Obama administration sent about 7,000 children to three military bases. Goodfellow looks like a college campus surrounded by barbed wire and security checkpoints. The base’s airstrip has not been used in decades. Today it’s primarily used as an intelligence research facility and a firefighter training center. Frank Carter, San Angelo’s police chief, said he will be meeting with officials at Goodfellow on July 9 to discuss how the facility will be operated and doesn’t expect children to arrive before then. State Rep. Drew Darby, R-San Angelo, said he’s worried about what housing potentially thousands of children at the base could mean for the community. "I have always supported Goodfellow Air Force base and their mission but have concerns these children will place additional pressures on our schools and water infrastructure,” Darby said in a statement to The Texas Tribune. “The Department of Defense has not informed us what the impact to the surrounding community will be and how long they will be here before being deported to their home country or reunited with family." Still, she said she has sympathy for the children who travel hundreds of miles to escape poverty and violence. Other locals said their city has a history of helping children in distress. In 2008, law enforcement raided the Fundamentalist Church of Jesus Christ of Latter-Day Saints’ compound near San Angelo after allegations of widespread sexual abuse of minors surfaced. Hundreds of children were removed from the church’s Yearning for Zion ranch following the raid, and Guy Choate, a local lawyer, said the whole community came out to the help the kids, with every child under the care of a lawyer who helped with things like inspecting potential foster homes. Taylor, the museum director, said he offered the museum to be used as a media hub during that incident, which drew journalists from across the country. Taytum Carmichael, 27, a pediatric medical assistant who lives in San Angelo, said she remembered the intense coverage the city received during the church compound raid and how much it disrupted life in town. But she still supports bringing the migrant children to town. Disclosure: Guy Choate has been a financial supporter of The Texas Tribune, a nonprofit, nonpartisan news organization that is funded in part by donations from members, foundations and corporate sponsors. Financial supporters play no role in the Tribune's journalism. Find a complete list of them here. Correction: A previous version of this story misidentified the operator of the migrant housing facility.